The southern Georgian Bay region is renowned for its natural beauty, the Niagara Escarpment, crystal clear blue water, the world’s longest freshwater beach and unparalleled recreational amenities from boating to private ski clubs and world class golf courses. The regions has been recognized as one of Canada’s premier four season recreational playgrounds offering the coveted lifestyle sought by many luxury home buyers seeking the relaxed sophistication reflected in the ultimate recreational property or full time retirement residence. 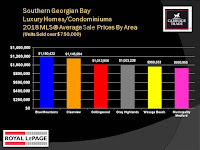 Real estate Broker Rick Crouch with Royal LePAGE Locations North (Brokerage) represents discriminating buyers and sellers in their quest to buy or sell the area's premium properties in Collingwood, Wasaga Beach, the Blue Mountains, Grey Highlands and Clearview. 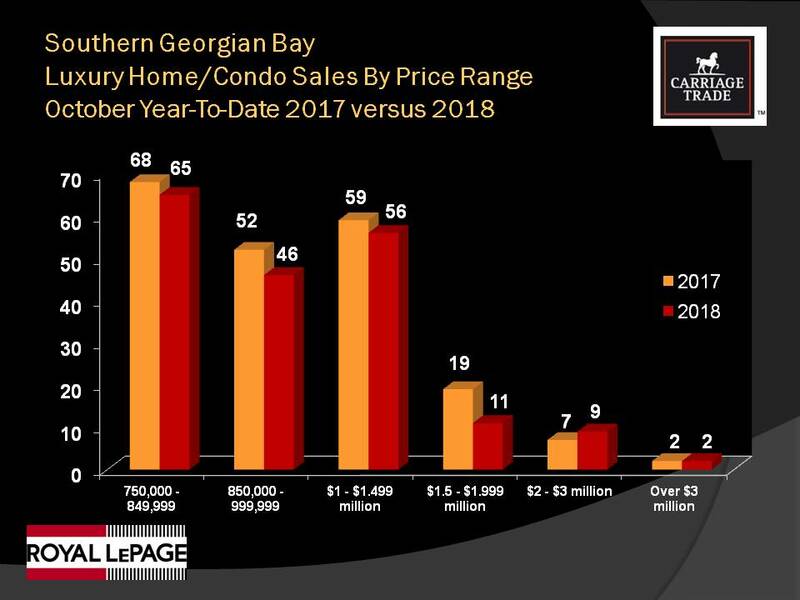 As reported in the 2018 Year End Real Estate Market Review post of my Live Play - Georgian Bay blog, sales activity across the southern Georgian Bay area softened in 2018 and this also included the high end luxury home segment of our market. (Click on graphs to enlarge). 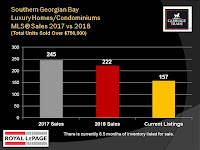 After running a number of statistical reports for last year, MLS® sales of homes and condominiums priced above $750,000 totalled 222 properties, 23 or 9% less than in 2017. Given the fact that MLS® unit sales in the area overall declined 24% last year, the upper end performed quite well. During the past five years sales of higher priced properties in our market have grown significantly from 82 units in 2014 to well over 200 sales in both 2017 and 2018. Even with the 9% reduction in MLS® unit sales last year, sales of properties priced above $750,000 were up 170% from just five years ago. 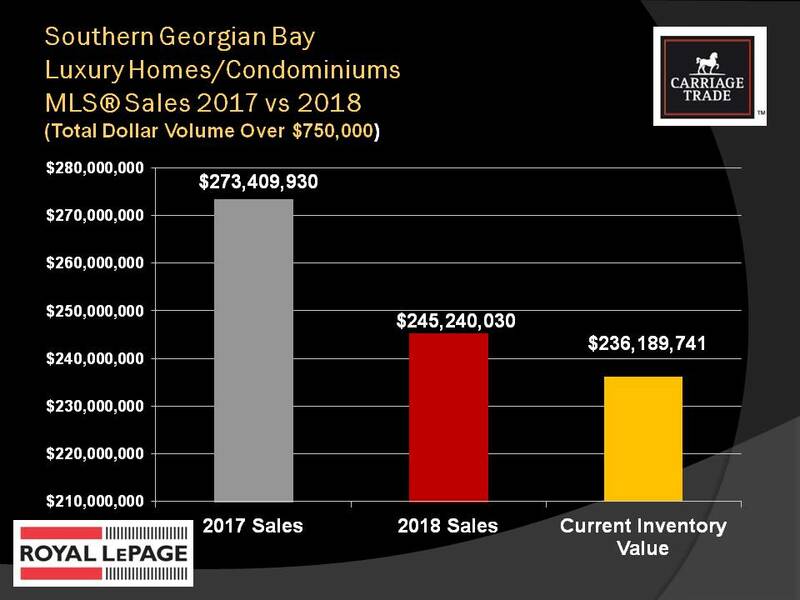 MLS® dollar volume in this segment of our market in 2018 totalled $245.2 million and while that was roughly 10% less than the level of sales in 2017, this amount represents over 25% of total MLS® sales in our area as reported by the Southern Georgian Bay Association of REALTORS®. 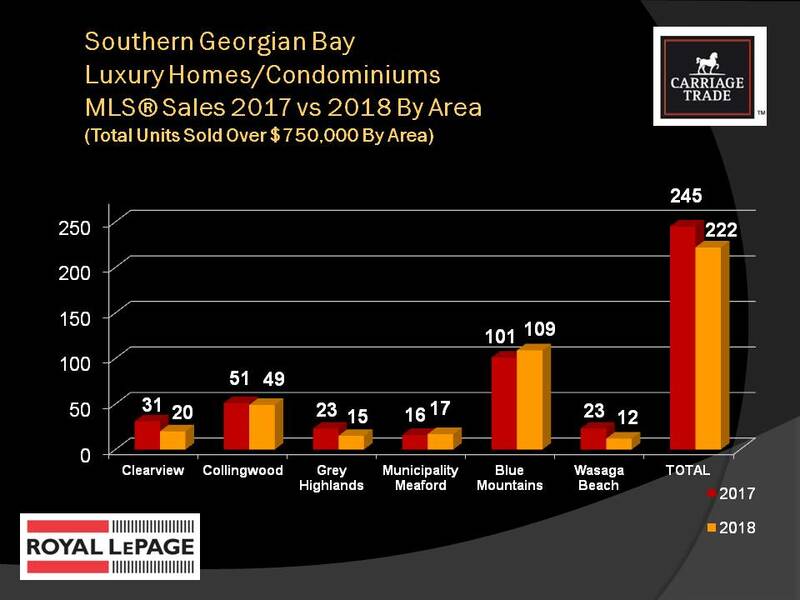 The lower MLS® sales results for higher price homes in the area was also impacted in 2018 by the significant number of new builds particularly in developments such as Lora Bay and Trailwoods both just west of Thornbury, in the third phase of Nipissing Ridge and others situated close to the base of Blue Mountain. 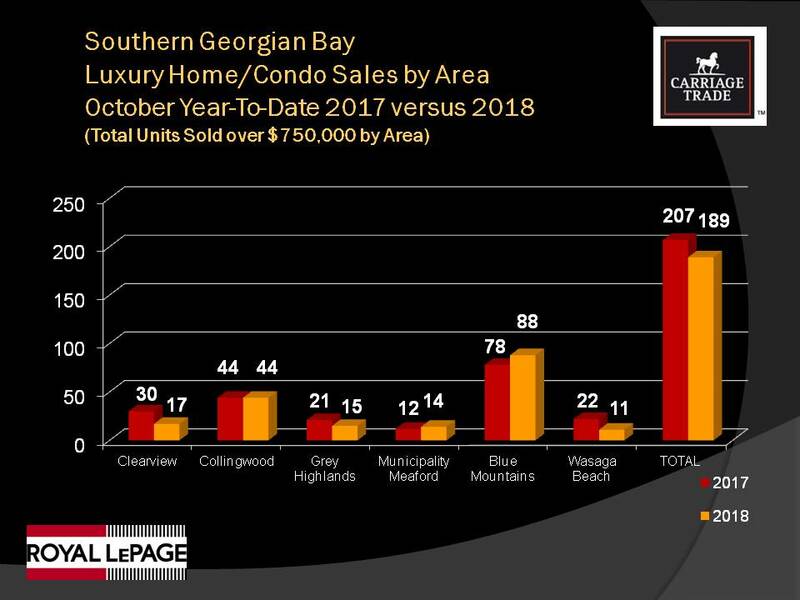 As shown in the accompanying chart, the reduction in higher end sales during 2018 versus 2017 was experienced in most price segments of the luxury home and condominium market with two exceptions. Properties sold in the $2 to $3 million range increased from eight sales in 2017 to eleven sales during 2018, an increase of almost 36%. MLS® sales above $3 million remained uncha nged from the prior year with three sales reported in both 2017 and 2018. 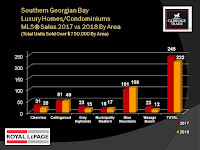 While the actual number of sales in these two segments is not large, these results clearly reflect that our market is continuing to move upscale with both full and part-time residents increasing to invest in expensive, finely finished homes and condominiums. 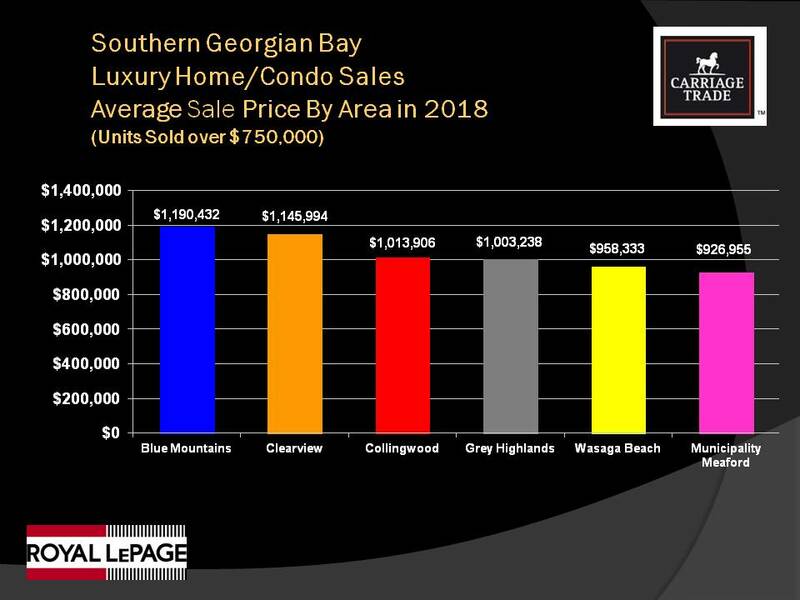 In terms of luxury home and condo sales by area, the municipality of the Blue Mountains had 49% of all properties sold above $750,000 in our market last year. Many of the buyers for these properties are members of the area's private ski and golf clubs and as such, desire a residential location close to those amenities as well as ready access to shopping etc. 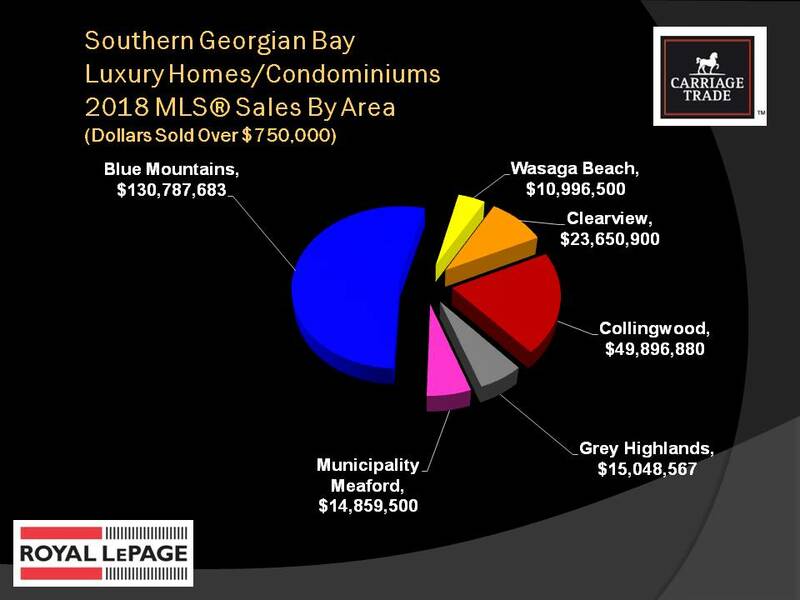 As shown in the attached graphs, MLS® sales above $750,000 in the Blue Mountains totalled 109 units and over $130 million last year. 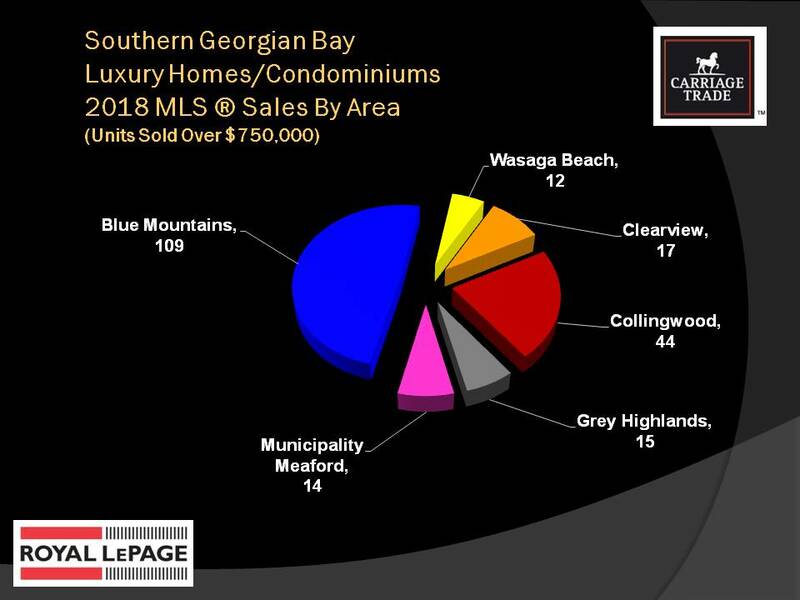 The town of Collingwood was a distance second with 49 sales totalling $49 million representing 22% of the market overall for higher end property sales in 2018. All other municipalities had MLS® sales ranging from 12 to a maximum of 20 residential units or 5% to 9% of the total market. In terms of prices, the Blue Mountains lead the market with an average sale price for properties above $750,000 of $1.190 million. 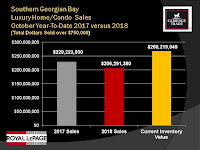 Clearview Township was second with an average sale price of $1.146 million with Collingwood coming in third with an average sale price of $1.014 million. Sales in the remaining three municipalities averaged from $927,000 to $1.003 million. 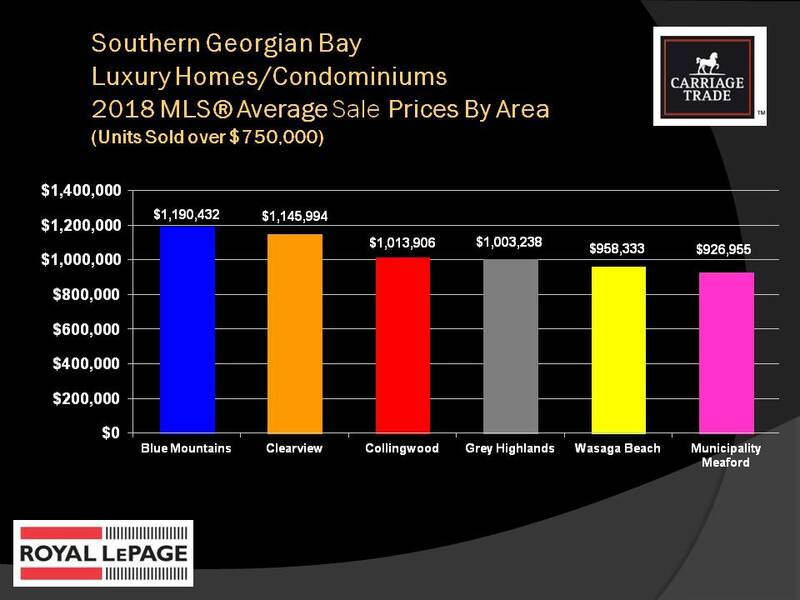 Of the three residential sales that were over $3 million, all were located in the Blue Mountains. The slowdown in market activity is somewhat seasonal in nature and will trend upwards in the months ahead as we approach spring. As of this post, there are 157 active MLS® listings for properties priced over $750,000 which represents 8.5 months of inventory based on the current rate of sales. 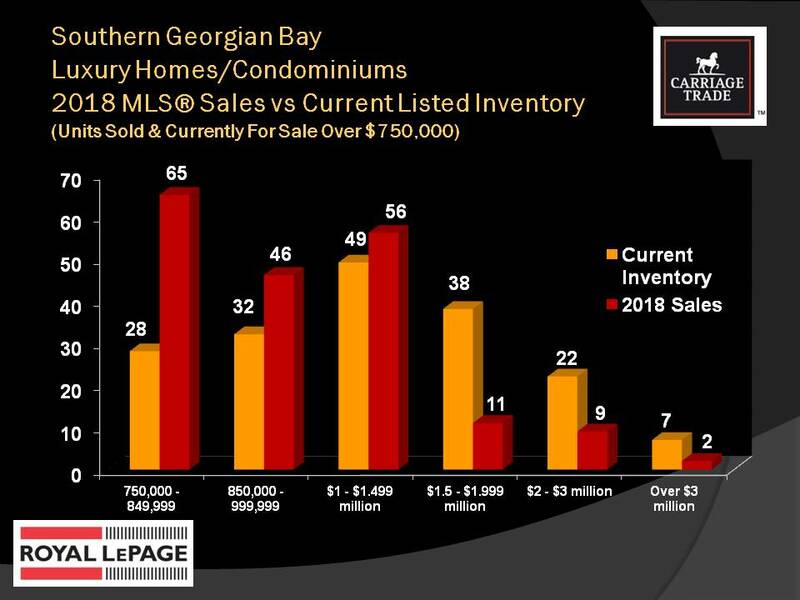 As per the accompanying graph the majority of these listings are in the $1.5 million range and higher where unlike below the $1.5 threshold, inventory in these price segments well exceeds total sales for all of 2018. Higher price homes and condominiums typically take longer to sell. The potential market for high price properties is smaller with fewer buyers in this segment. The higher the price the longer it generally takes to sell. Properties sold in 2018 above $750,000 were on average on the market for anywhere from 52 to 123 days depending on price. Right now active listings currently for sale have been on the market for anywhere from 70 to 144 days. As we head towards spring it will be interesting to see how this segment of our real estate market behaves. 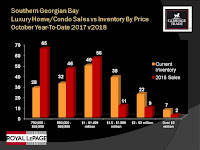 Given weaker sales and market activity in the Greater Toronto Area (GTA) buyers of luxury homes appear to be stepping back and are taking a wait-and-see attitude before committing to a purchase. At the same time two area waterfront properties recently sold for over their asking price and I am aware of another sale which was over $2 million did not close due to insufficient funds so there are definitely some mixed signals being sent. Overall I remain positive about the level of market activity we will see in the coming year. At the same time however both buyers and sellers need to be well informed and advised about pricing, market activity and other factors that may impact their buying and selling objectives. The market has definitely changed, multiple offers are no longer as prevalent as they were in 2016 and 2017. For sale signs without SOLD stickers are much more commonplace. Those are the things that we as REALTORS® need to excel at communicating with our clients. We need to follow the market closely, know the numbers and share them with our valued clients to assist them in making informed, rational decisions. Copies of my other real estate market reports are available on the Newsletters page of my website www.rickcrouch.realtor. Please feel free to contact me if you have any questions or would like a no obligation consultation as to how current market conditions relate to your real estate buying and or selling needs. 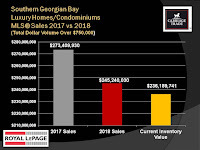 Download a complete copy of my 2018 Year End Sothern Georgian Bay Carriage Trade Homes Market Review located on the Luxury Homes page of my real estate website. Copies of my other real estate market reports are available on the Newsletters page of my website. 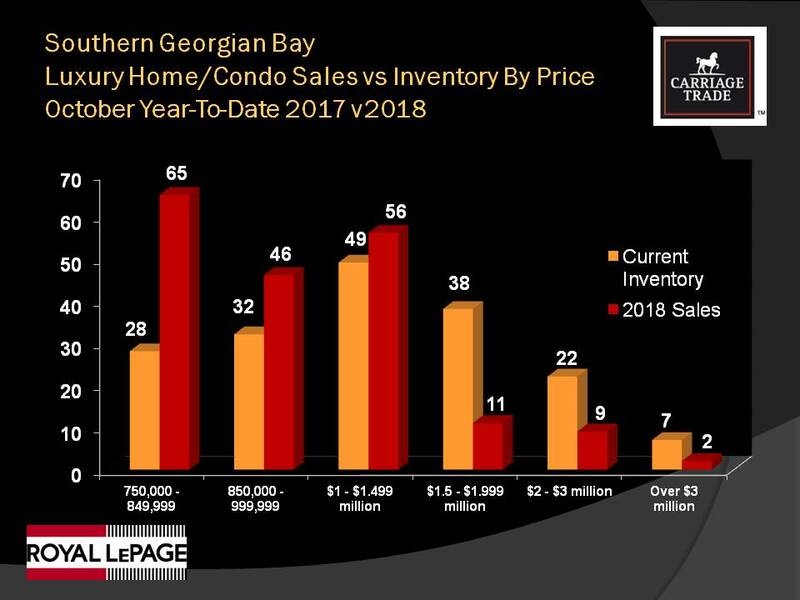 As previously covered in my regular real estate blog, year-to-date real estate sales across southern Georgian Bay in 2018 are running well below what we experienced in both 2016 and 2017 and nowhere is this more prevalent than in the upper price segments of the market. 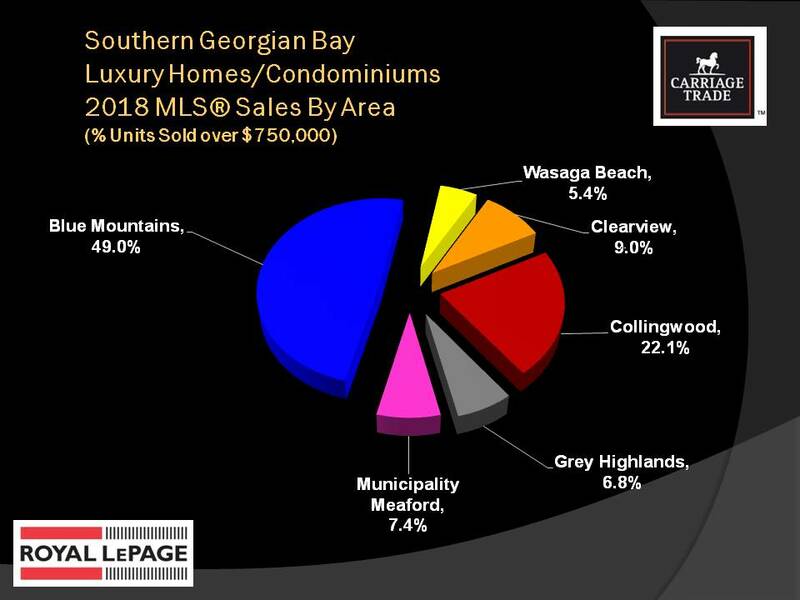 Once again to clarify what constituents the upper price segments of our market, we consider anything over $750,000 to be the luxury home and or condo segment of our market as typically this represents approximately the upper 10% of unit sales through the MLS® system of the Southern Georgian Bay Association of REALTORS®. MLS® sales over $750,000 for the first 10 months of 2018 total $206.3 million compared to $229.3 million in the same period last year. That represents a 10% decrease in dollar sales year over year. Similarly, MLS® unit sales of 189 properties priced $750,000 and higher this year are down 12% from the same time in 2017. 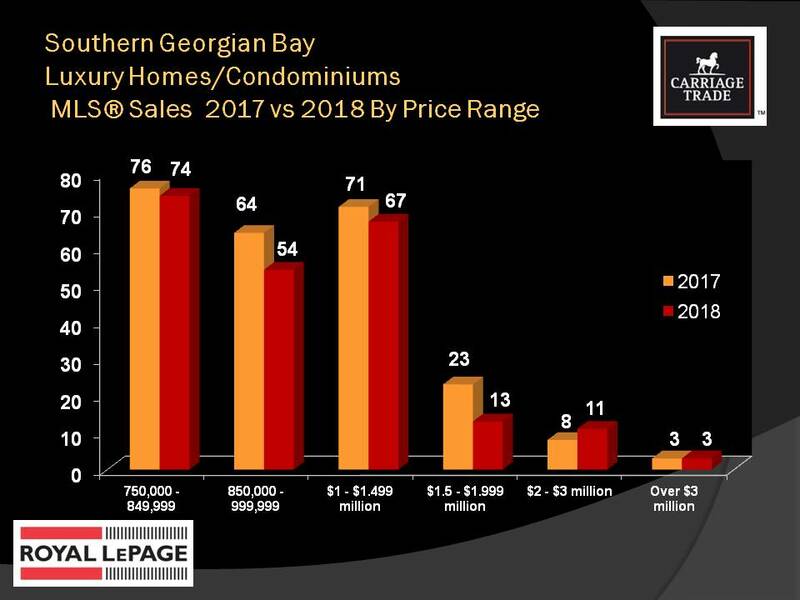 The two price segments that are impacted the most are those properties priced between $850,000 to $999,999 and those in the $1.5 to $2 million category where year-to-date unit sales are down 10% and 42% respectively from the first 10 months of 2017. Two areas that are not reflecting this slowdown in market activity are Collingwood and the Blue Mountains. MLS® sales above $750,000 in Collingwood are running at the same pace as in 2017 with 44 sales reported through the end of October. Sales above $750,000 in the Blue Mountains are actually ahead by two units with 88 sales in 2018 versus 86 last year. The demand for luxury properties in the Blue Mountains remains the highest in our area with most affluent buyers preferring a property that is in close proximity to the area's private ski and golf clubs. Of the 189 upper end sales reported through the first 10 months of 2018, 46.6% are in the Blue Mountains and this area is also home to the highest average sale value an average year-to-date price of $1.190 million compared to the Township of Clearview which has an average sale price of $1.145 million or roughly 4% less. 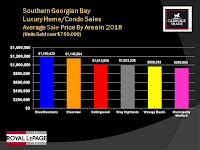 Average upper end sale prices in the remaining area municipalities are as follows: Collingwood $1.013 million, Grey Highlands $1.003 million, Wasaga Beach $958,000 and the Municipality of Meaford $927,000. The upper end of our market is one area where the inventory of available properties for sale is not in short supply as is the case overall. As of this post there are 184 properties listed for sale over $750,000. Based on the current rate of sales this represents almost 10 months of inventory which is a significant amount when the overall average days-on-market for sold properties is running 47 days. Inventory levels are particularly high above the $1.5 million threshold (see chart). 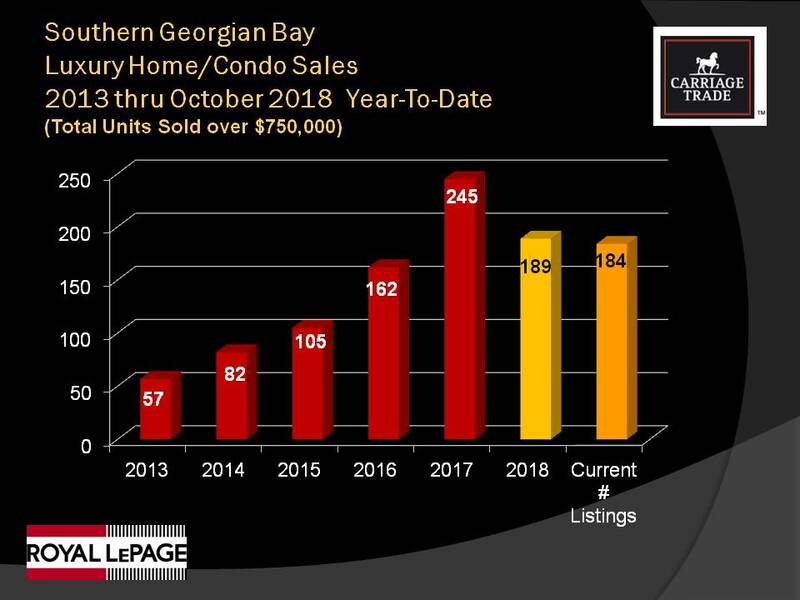 October year-to-date there have been 22 sales above $1.5 million. 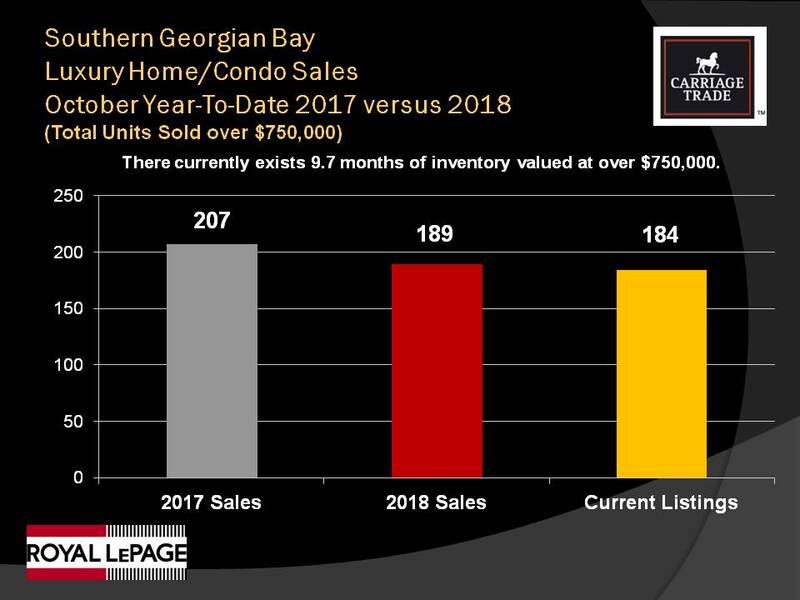 With 67 active listings and MLS® sales running at just over 2 units per month, there is in excess of 30 months worth of inventory above $1.5 million to be absorbed and I do not see this happening any time soon. 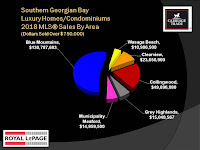 So what does all this mean to potential buyers and sellers of luxury home and condominiums in our area moving forward? First I am not a pessimist nor is the information herein to be taken as being negative. As a licensed real estate Broker for the past 18 years I have always studied the data available to us. That information is key to helping us provide my real estate clients with the information they need to make qualified and informed decisions. 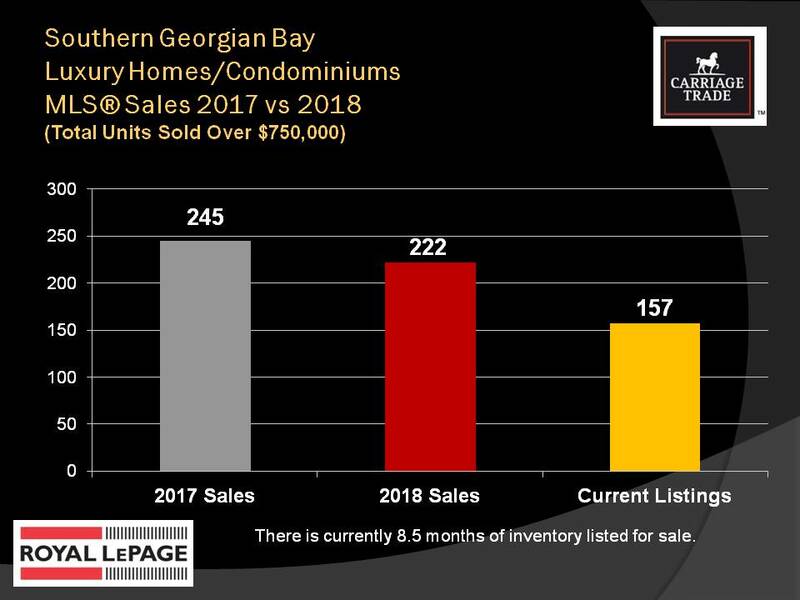 Starting in May 2017, the local real estate market here in southern Georgian Bay and elsewhere has clearly shifted. With the odd exception, gone are the crazy bidding wars resulting in over inflated sale prices. Total MLS® sales dollar volume and unit sales in our area for 2018 will finish 15% to 20% below the levels we experienced in prior years. Canada Mortgage and Housing forecasts weaker sales across Canada through 2019 and 2020 in addition to fewer new home starts. In my opinion this will create a more balanced market for both sellers and buyers. Perhaps the bigger question will be what happens with interest rates. Mortgage lending rules have crept up as have interest rates and this has clearly put the brakes on some buyers ability or willingness to purchase property at this time. 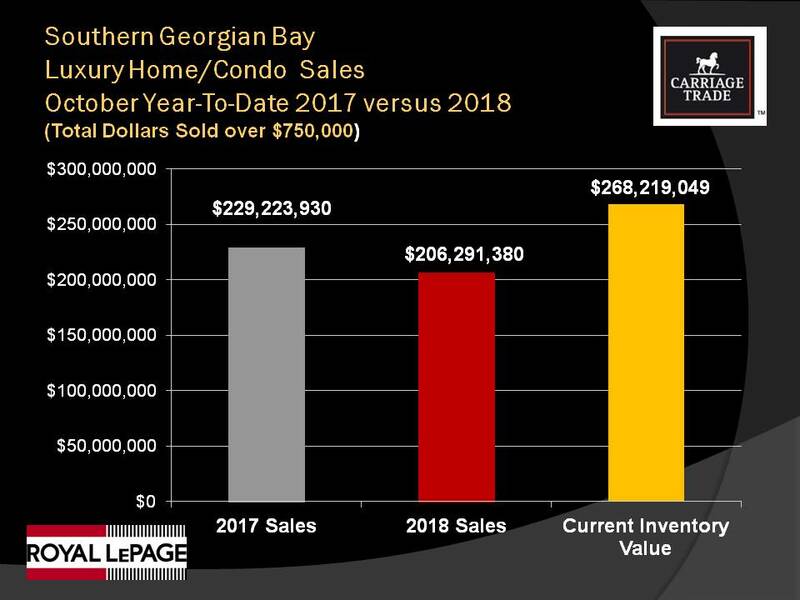 Clearly the buyers of homes and condos priced above $1 million have already taken this stand reflecting fewer sales in our local market for 2018 coupled with a sharp increase in inventory. 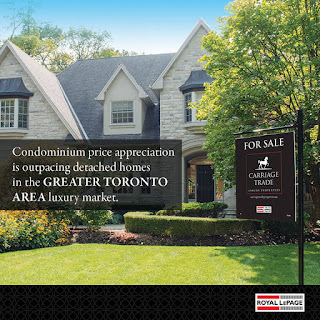 Luxury home sales in Toronto are down 35% this year and what happens in the GTA always impacts our market here as well. Property 1 - Listed originally at $3.65 million the price was reduced to $2.95 million and sold for $2.65 million, a full $1 million (27%) below the original asking price after 293 days on market. Property 2 - Listed at $4.2 million with several price adjustments (up and down) it sold for $3.25 million, $950,000 (23%) below asking after 1,057 days on market. Property 3 - Listed at $989,000, the price was reduced under power of sale and sold for $851,000, $138,000 (14%) below asking 181 days on market. These examples illustrate that there are still some good values to be had by waiting. Don't get caught up in the frenzy of multiple offers, waiting to make an offer on the right property at the right time can pay off, as they say "patience is a virtue." 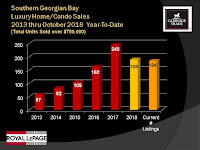 Click on each chart to enlarge or click Southern Georgian Bay Carriage Trade Homes to download or view a full copy of my latest luxury home marketing report. In my next post I will speak further to the importance of sellers pricing their home or condo correctly to sell and what buyers need to be a ware of when purchasing. In the meantime for further information or questions on any real estate related topics please feel free to Contact Me. Royal LePAGE Canada has just released their report on the luxury home and condominium market across Canada. 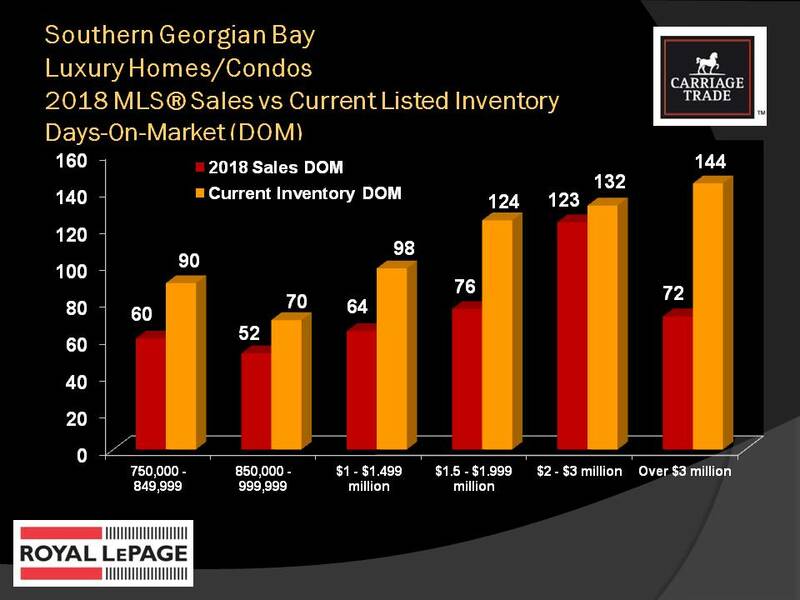 Below is what they have reported for the country overall with an emphasis on the Greater Toronto Area, a market that plays a direct role on what happens in our local market here on southern Georgian Bay. 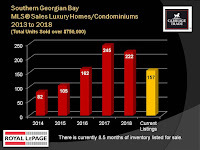 Detached luxury home prices in Greater Vancouver are forecast to decline in the first four months of 2019, decreasing 3.0 per cent year-over-year to $5,619,153, while properties in this segment in the GTA are estimated to remain flat (0.0%) over the same period. The Greater Montreal Area and Ottawa are both forecast to increase 5.0 per cent year-over-year, and detached luxury homes in Calgary are expected to rise 2.0 per cent during the same period. 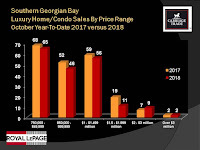 The median price of a luxury detached home in the Greater Toronto Area remained relatively unchanged (-0.2%) at $3,522,117 in the first four months of 2018, while the median price of a luxury condominium increased 10.4 per cent year-over-year to $1,710,365 during the same period. On April 20th, 2017, the Ontario government introduced a 15 per cent non-resident tax on home prices in the Golden Horseshoe as part of the province’s 16-Point Fair Housing Plan. 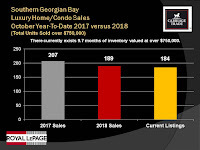 Leading up to the announcement, the median price of a luxury detached home in the first four months of 2017 was $3,527,882, a 23 per cent increase over the same period in 2016, while luxury condos appreciated 8 per cent to $1,549,864. During the first quarter of 2018, luxury detached home sales decreased 67.9 per sent year-over-year. However the decline was significantly more modest when compared to the same period in 2016 (-18.1%). 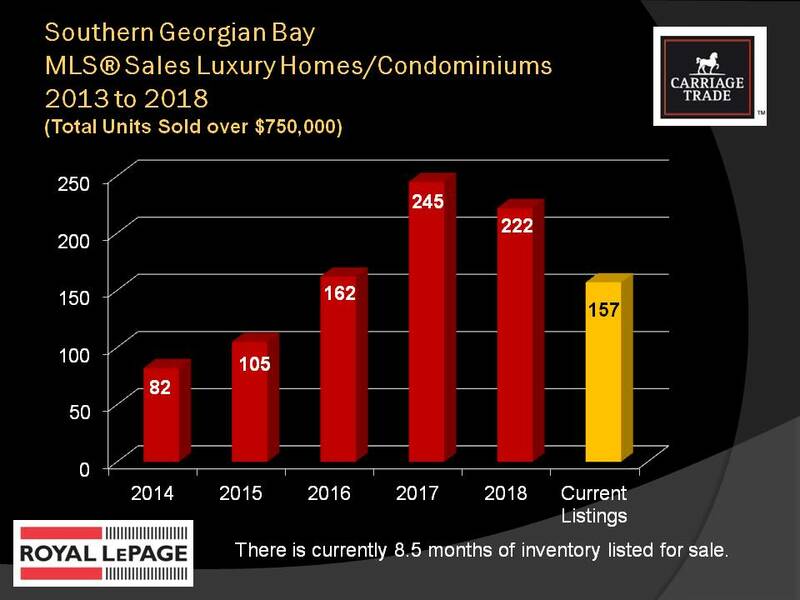 In the first quarter of 2018, luxury condominium sales decreased 28.2 per cent year-over-year compared to the same period in 2017, while almost twice as high (90.6%) compared the same period in 2016. The region’s high quality of life for families, a result of good schools and excellent healthcare, is expected to continue to drive foreign buyer interest in the detached luxury home segment once the real estate market adjusts to government measures, and consumer confidence improves. While luxury home price appreciation stalled, demand for luxury condominiums remained strong largely driven by established homeowners. “The selection of luxury condominiums has greatly increased over the years and we are seeing more retirees selling their luxury homes to buy condos with great amenities and little upkeep. Condominiums are also easy properties to manage when you want to spend more time travelling,” added Davis. When looking ahead to the 2019 spring market, the median price of a luxury condominium in the Greater Toronto Area is forecast to increase 8.0 per cent year-over-year to $1,874,194, while the median price of a luxury detached home is forecast to remain flat (0.0%) at $3,523,378 when examining the first four months of the year. “Our longer term forecast for the Greater Toronto Area real estate market, including the luxury market, is for healthy price appreciation. The region has experienced significant inventory shortages for many years, has a robust economy and an international reputation as a great place to live and work,” concluded Davis.